Obviously, this isn't our last Thanksgiving...but it will be the last one we celebrate with Tommy's family in New England. I was having nostalgic memories about it during this holiday weekend - I've spent the past 5 or 6 Thanksgivings with those lovely people...eating their crazy yummy creations...in a house with over 25 people...with loud laughter, a bustling kitchen, and insane amounts of food everywhere. (Not just any food...Martha Stewart-esque creations... almost too pretty to eat). From what I understand, the host of the Thanksgiving event encourages *new* recipes instead of having the same menu with the same dishes year to year. So there are variations on the traditional fare every year...which is a pretty exciting and unique way to do it all. The food coma lasts well into the next day. Taken after dessert consumption...the food comas were starting to set in. I am so bummed with myself for not taking more pictures this year. Of the food...the faces...the smiles...the glorious centerpieces...my daughter! I have a feeling that I will truly miss calling the north east home, even though I am beyond thrilled about moving back to Arizona at the end of the summer. I will miss spending these special holidays with this side of our family (even though I can't wait to celebrate with my sisters and parents again!) There is something that just feels right about celebrating Thanksgiving with a warm fire roaring in the fireplace, while it is crisp and cold outside and the leaves are yellow and orange underfoot. Feeling thankful for my married family this weekend. And how they have welcomed me so graciously and lovingly when I wed their Tommy. 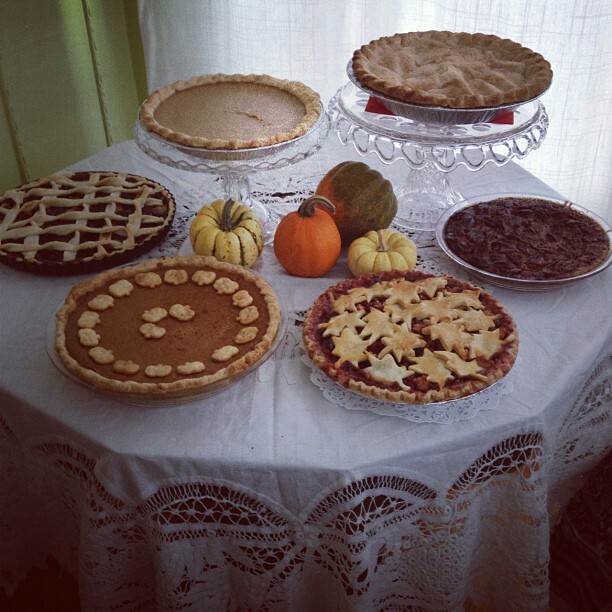 And I'm thankful for the dessert spread this year. It was fabulous. You'll never ever visit during the holidays??? ?